It's not easy being Leonardo DiCaprio. While preaching that fossil fuel use is triggering a global climate catastrophe, Leo hops around the world on fuel-guzzling private jets. "If we do not act together, we will surely perish," he tells the United Nations. I'll say it again: Leo has a hard time aligning his message with his actions. It's not easy being Leonardo DiCaprio. 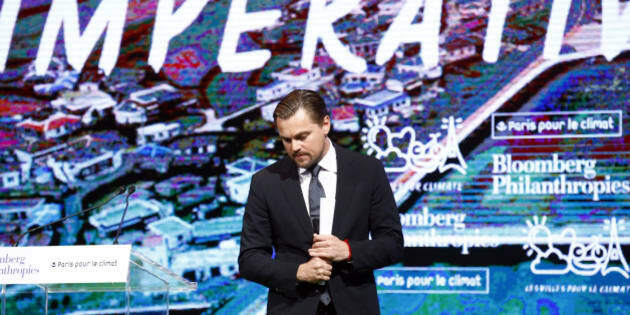 While preaching that fossil fuel use is triggering a global climate catastrophe, Leo hops around the world on fuel-guzzling private jets and giant, diesel-fired yachts. "If we do not act together, we will surely perish," he tells the United Nations in a widely hyped keynote speech. I said this a couple of years ago, and I'll say it again: Leo has a hard time aligning his message with his actions. But while many in the general public treat his activism skeptically, his acting is actually pretty good. After having been shut out of the Oscars year after year, these days Leo is on a wild ride. The Revenant, said to be the hardest thing our celluloid hero "has ever done," was filmed in rugged Alberta, British Columbia and the country of Argentina. Ice-cold rivers featured prominently in many of the shots conceived by director González Iñárritu. Leo spent much of the time sick and/or exhausted, according to reports. The pay-off? The Revenant has already earned him a Golden Globe and an Oscar nomination, and the film is being touted for 11 more Oscars! Fact is that when he's on-script, the man is amazing. It's when he goes back to living his life off-script that his performance often turns into a five-alarm disaster. So, since it's been a while since I checked in with the actor-turned-activist, and since The Revenant is generating huge box-office buzz, I thought it was time to get in touch again. First -- congratulations. It's shaping up to be a great year for you -- bigger than Gangs of New York, Aviator and Django Unchained. I figure we'll all be talking about The Revenant for quite a while. But I've been watching media reports about your off-screen activities over the last while and I feel you still need a hand to put a few things into focus. So here's my renewed contribution. It was a smart move to lose the yacht, Leo. Remember those hundreds of news stories back in 2014 that covered your little visit to the FIFA World Cup in Brazil with your entourage. Remember how you partied on the Topaz, the world's fifth-largest super yacht owned by your friend Sheikh Mansour bin Zayed Al Nahyan, deputy prime minister of the undemocratic oil giant, United Arab Emirates? Well, I haven't seen any media reports about you partying on the Topaz lately. And that's probably wise. I mean, come on, Leo. The Topaz is powered by two 8,000 horsepower diesel engines -- a combined 16,000 thunderous horsepower of diesel propulsion, enough to hit a maximum speed of almost 26 knots. For a 480-foot super yacht, that's really, really fast. I'm pretty sure solar can't do that. Didn't any of your entourage tell you the yacht was also equipped with a shaft generator, an emergency diesel generator and two more conventional diesel generators to power the stabilizers, navigation equipment and all the facilities? On leaving a fossil footprint, Leo, it seems you don't go for half measures. "To give your 'we will surely perish' speech in front the UN just a couple of months after you'd been seen partying on the Sheikh's giant CO2-generating monster-yacht, is... well... truly Oscar material." And no, David Geffen's super-yacht The Rising Sun (the one you borrowed last summer for the Cannes Film Festival) isn't much better. These vessels typically burn thousands of litres of marine diesel -- PER HOUR! But I do have to hand it to you. To give your "we will surely perish" speech in front the UN, and with a straight face, just a couple of months after you'd been seen partying on the Sheikh's giant CO2-generating monster-yacht, is... well... truly Oscar material. Then there was your Variety interview and the horror of (wait for it...) the Chinook. Remember that? "It's terrifying," you told Variety. During filming in Alberta, "there would be eight feet of snow, and then all of a sudden a warm gust of wind would come -- and it's what people are talking about all over the world!" Wow. A quick point on Chinooks, Leo. Some say the term was native to B.C. coastal tribes and was, in fact, brought to Alberta by the fur-traders -- like the ones depicted in your Hollywood film. Far from being "terrifying," warm Chinook winds are a long-standing and treasured aspect of our beautiful Alberta climate. We've always valued them. Fast-forward to your Golden Globe win for The Revenant earlier this month, when you shared your award with Indigenous people. "It is time that we recognize your (First Nations) history," you said, "and that we protect your indigenous lands from corporate interests and people who are out there to exploit them." "The Revenant is not an indigenous story. Like Dances with Wolves before it, (among many others) it is an American fable that uses First Nations characters to support its allegorical intent, and one that never escapes the colonial gaze of the Western genre." Some First Nations members took to Twitter: "Let me get this straight: (DiCaprio) denounced corporate exploitation of indigenous lands," one commentator said, "while accepting an award for doing exactly that?" It doesn't really add up, Leo. Nor does your opposition to the oil sands and indigenous employment. The oil sands industry is one of the largest single employers of Aboriginal people in Canada. Aboriginal-owned companies secured over $10 billion worth of contracts from oil sands enterprises in the region. A lot of people are proud of those partnerships. Leo, I'm not convinced Alberta really needs your hypocritical vision to "save" our province, Hollywood-style. But for powering your glitzy lifestyle, or for locations where you can film your colonial-tinged Western blockbusters, it seems you tend to gravitate toward Alberta. So... call me. That lunch offer still stands.